60.9 CFM High airflow to enhance excellent cooling performance. Silent operation at 16 d-BA for case cooling. 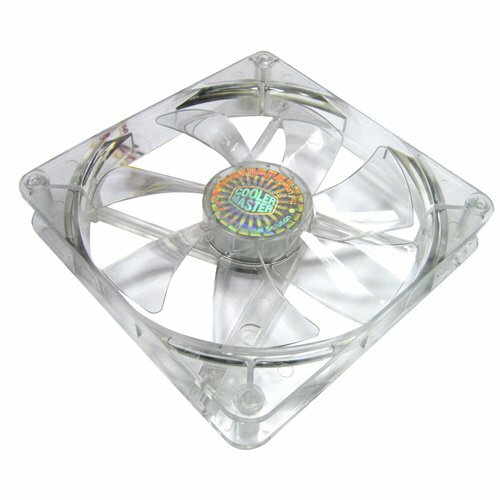 This fan looks great for it's bright LED, and moves air okay. I take one star off of it as it does not seem to move as much air as two 120mm fans. I could be wrong, but with my fan control all the way up on this I feel like it gets overpowered easily with other fans near it (such as my cpu fan). Almost like air is being sucked down around it while it's pushing air out. I take another star off because I feel like it was entirely too hard to screw into place with everything lined up perfectly (I work in IT and I deal with hardware alot. This is not my first rodeo with a screwdriver in a tight spot.) It just felt like the pre-made holes for the screws that came with it where wayyy too small. Great color, quiet fan. Shines through the window of my case very well. No problems.